Thoran is a staple in malayali cuisine. Its made with all kind of vegetables and pulses. Its mild and coconut and cumin is the most important ingredient but then based on the vegetable used there can be some special spice addition. 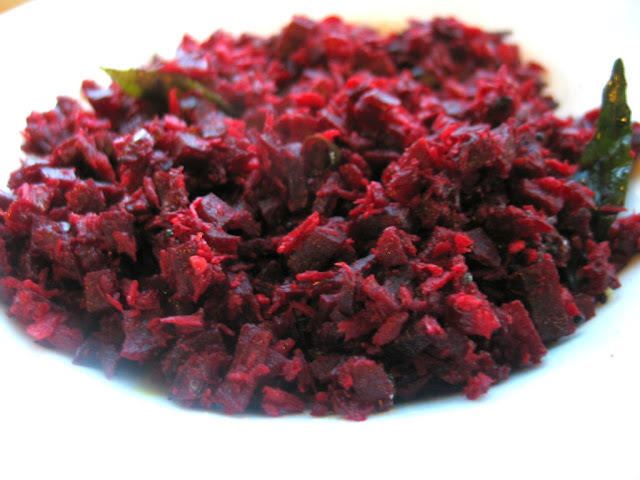 For beet root thoran it is black pepper and lots of it. 1. Wash and par boil the beets. I usually pressure cook to just one whistle. 2. Cook , peel and chop it fine. 3. Heat oil and mustard seeds and let it pop. 4. Add onion and green chilli and cook till onion is translucent. 5. Crush the cumin seeds and mix it with coconut and add it to onion. 6. Add beets ,turmeric, black pepper and mix well. 7. Cover and cook for 2-3 minutes and beets thoran is ready. Very simple yet healthy recipe with a nice color to it! Yummm!! !simple but yet a delicious thoran.. Simple and yummm thoran!!! love the colour! such a nutritious and lovely colored veggie..nicee..
My daugh fav veggie..delicious thoran! !